The decision to choose a chemical management solutions provider will directly impact your organization in a number of vital ways. From employee satisfaction and safety, to OSHA compliance and company reputation, multiple aspects of your business have the potential to be directly impacted. Take this decision seriously! MSDSonline solutions from VelocityEHS provide business of all shapes and sizes — and in all industries — with the tools they need to ensure that employees stay safe and workplaces remain compliant. As the largest player in the industry, we know what it takes to give businesses the tools they need to effectively manage their safety data sheet library and enhance workplace safety for everyone. We think that the best way to appreciate the outstanding value the MSDSonline HQ Account provides is to see how it stacks up against the competition. 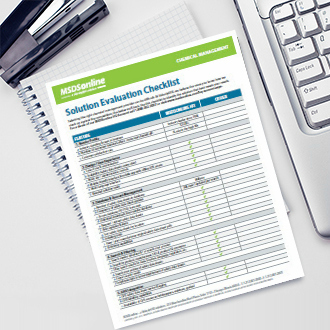 Use this downloadable checklist to explore the features and benefits that come with the MSDSonline HQ Account, and compare them to the offerings that may, or may not, be offered by our competitors. Our best customer is an educated customer.